ALONG with creating a host of all-new Bonnevilles, reworking the Speed Triple and revamping the Explorer range, Triumph has been hammering together this new Tiger 1050 variation – and it might turn out as the bike the Tiger 1050 has always aspired to be. You can instantly see the obvious changes – that big, adjustable screen is the headline bit, and finally answers one of the main requests made by Tiger 1050 buyers over the years. And it’s grown panniers. You might recall that back in 2010 Triumph took its slow-selling Sprint ST and turned it into a bargain tourer, the Sprint GT, which gained a loyal following. This is the Tiger performing the same trick. Where will it leave the Sprint GT? Probably on the sideline, since it’s not likely to pass Euro 4 emissions limits that come into force at the start of next year without getting the same engine changes that the Speed Triple has recently received, and there has been no sign of that happening. 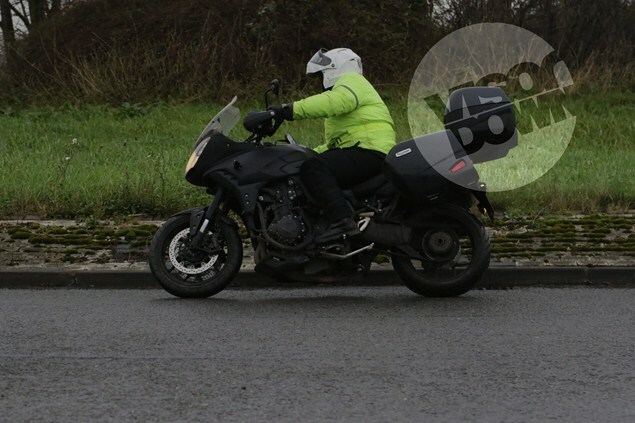 In contrast, an updated Tiger Sport was spotted on test last year with the new Speed Triple engine mods, and Visordown understands the launch is imminent. This new Tiger GT also gets the updated engine. The visual giveaway is a reshaped exhaust manifold and repositioned catalytic converter, but the upgrades will include the improved head and combustion chambers of the Speed Triple, ride-by-wire throttles, selectable riding modes, traction control and improved economy. By meeting Euro4 standards the revamped engine gets its production life stretched until at least 2020/21 when Euro5 is set to be introduced. It’s likely that the power will remain a little lower than the new Speed Triple’s 140hp, but it’s probably going to be higher than the 125hp of the current Tiger Sport. In terms of price, something in the region of £10,000 is likely – around £800 more than the current Sprint GT. But the Tiger both fits the current zeitgeist for ‘adventure’ tourers (which really means ‘tall’ rather than implying any true off-road ability) and should offer more practicality thanks to details like the adjustable screen, not to mention the traction control, which could be a literal lifesaver on a bike designed for serious mileage and all-weather use.